Before you start reading, we want to remind you to take advantage of these great promotions just for you and maybe you too will come up with a great poker story for us and the entire poker world and community, who knows? So, it's time to enjoy our promotions and get your $88 free at 888Poker (No deposit needed!) and if that's not enough, you can also claim your $20 free at PokerStars today! Now, it's time to read some interesting poker stories you probably didn't know about, but even if you did it's always fun to read about them again. This is without a doubt a very interesting and unique story that entered poker history for Obrestad's amazing achievement, one that no other poker player (pro or amateur) was able to repeat. Annette Obrestad started playing poker at the age of 15, but couldn't deposit money to a poker account because of her age. So, her only potion at this point was to try and earn money playing free-roll tournaments. She began playing the various free-rolls and when she won a free-roll to have $9 in her bankroll, her poker career started and took off. Yes, from $9 only she was able to reach greatness. With this $9 she quit playing free-rolls and started playing real money tournaments, with one specific win that made her famous. In this specific tournament, Annette decided not to check her hole cards at all and simply play according to her position in the table and the actions of her opponents to prove you can win a poker tournament just by playing your position correctly and reading your opponents, without knowing the cards you're holding. Annette looked at her cards during the tournament only once when she was in an All-In situation, but other than that she played perfectly reading her opponents and eventually winning this tournament. Obrestad later said that she wondered how she could survive in a tournament not knowing the cards she's playing, but always thought that if she plays carefully and also watch her opponents and their moves then she'll be able to take advantage of it and win the hands no matter the cards she's holding, which she did. After winning this tournament the amazing way she did, Obrestad was so emotional that she wrote about this win in a forum and from there on word spread all over the internet and the world, making her famous in the poker world and poker talk. These days Annette Obrestad is one of the best professional poker players around, winning online and live tournaments all over the world, just don't ask her to repeat this great achievement again because she's proven enough. The 37th president of the United States from 1969 to 1974, Richard Nixon was a lieutenant in the Pacific Navy during World War II. In that time (when he had breaks from fighting bad guys) he enjoyed playing poker and from money he won playing five-card draw, he was able later on to finance his first election campaign to presidency. In his biography, Nixon wrote that with poker he learned when a person has a good hand, he is usually calm and quiet but those who are bluffing often speak loud and posing. If you happen to wonder about the current president of the United States, Barack Obama he also enjoys playing poker and claims to be a good poker player. It took only a few hours but at the end, Viktor Blom also known by his online nickname "Isildur1" lost a fortune which sums up to over $4.7 million! There was always mystery surrounding Blom before knowing who he is as the poker world knew him only by his nickname and nothing more. One of the biggest questions around Blom was how could he lose such an amount after being known as a great poker player, one who destroys his online opponents and winning huge amounts of cash only to lose it later on. In this cruel losing session, Blom was playing against Brian Hastings when at first the blinds at the table were $100/$200 and Viktor started well winning $500,000. Later on, his game went bad and his bankroll started to get down, so much that in less than 3,000 hands he already lost more than $4.7 million. Brian Hastings confessed later on that he joined forces with poker pros Brian Townsend and Cole South in order to learn all the hands Viktor Blom played and thus find the key or special factor to the hyper-aggressive game of Viktor. There's no need to feel sorry for Viktor Blom, because a poker pro that has $4.7 million to lose will find a way to win more millions in the future, we should be so lucky. The Origin of the Phrase "The Nuts"
The known phrase "the nuts" in poker refers to a hand which is unbeatable. According to some experts in the world of poker, this phrase originated way back in the old west where players used to bet their own horses and wagons. When a player put up his wagon and horse in the game, he would be required to remove the nuts from the wagon wheels and place them in the pot, this way he was unable to run away and flee if he lost the bet. In this case, it was assumed that no one will bluff wagering his horse and wagon, so if someone bet his horse and wagon in the hand, he probably has the best possible hand. If we'll start betting our cars, you think we'll change the phrase? I guess by now you are all familiar with Chris Moneymaker, a former accountant turned poker pro. Well, he was the one who started the poker boom and made everyone understand that even an amateur player can win the biggest poker tournament in the world. Prior to his amazing win at the World Series of Poker (WSOP) Main Event of 2003, Moneymaker (yes, it is his real name!) had been playing poker for only 3 years, so he had no big expectations when he entered the Main Event, because just playing there was a big achievement. Moneymaker entered a $40 satellite to the Main Event and won it to get the prestigious ticket to play the WSOP. It was his first live tournament ever so no one even knew who he was, for him it was a bonus to play the event and what a life changing bonus it was, we should all be so lucky. Now days Chris Moneymaker is a full time poker pro and he is well known to everyone in the poker world, pros and amateurs. 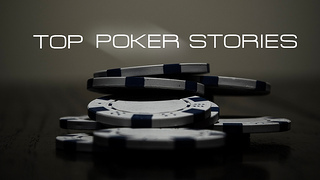 These were only 5 amazing poker stories we decided to mention and share with you, but there are so many others and more to come. Follow our site for great poker promotions, free poker cash and bonuses and of-course stories, facts and videos that never bore us and never stop to amaze.